Silvermine Nature Reserve forms part of the Table Mountain National Park and is just 20 minutes’ drive away from the city centre. 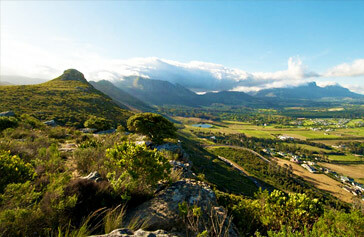 It envelops part of the Cape Peninsula mountain range, from Kalk Bay to Constantiaberg. Silvermine Nature Reserve takes its name from the Silvermine River, which starts its course in the reserve and runs to Clovelly. It is an easy getaway from the hustle and bustle of the city life and offers some relatively gentle walks compared to the more rigorous hikes up the mountain. Hence, it is a good option for younger, or older visitors and those who might not be fit enough or have enough time to go on a longer hike. There are many attractions at the Silvermine Nature Reserve - popular and well-known mountain bike trails, hiking, bird-watching, viewpoints with spectacular sceneries, the Silvermine reserve is a favourite destination for locals and tourists alike, particularly on weekends, when many city dwelling families make the short trip here. Following one of these hikes, a relatively short trail, will lead to a viewing point, where the view encompasses a panorama stretching from False Bay, all the way around to Cape Point, the famed meeting place of the Indian and Atlantic oceans. Another attraction that would be worth visiting while exploring the reserve is the Silvermine reservoir, located on the North side of the reserve, and dating back to 1898, when it was built to supply water to the growing Cape metropolis. For more adventurous adrenaline seekers, the Muizenberg area of the reserve offers rock climbing, as well as sandstone caves to be explored. Also located within the reserve, although restricted to the public, is the South African Naval headquarters which sits lower down the mountain. That said, it’s also possible to walk up the back of Table Mountain from Silvermine - pretty much a full-day hike for the fitter visitor. The reserve serves also as an important conservation area for indigenous fynbos plants. Apart from walking and hiking, it’s also a popular spot for bird-watching, picnicking, and mountain biking. Silvermine Nature Reserve also has a number of sandstone cave systems and rock climbing routes to Muizenberg. The relatively short hiking trails lead to a point where a picturesque view of the landscape stretching from False Bay, all the way around to Cape Point, can be viewed. One of the easier walks circles around a large reservoir. A boardwalk accessible to wheelchairs and prams is in place for much of this walk. There are also several picnic and braai areas in the park, including some along this picturesque trail. The reservoir dates back to 1898 and was built to supply water to the growing city of Cape Town. The park straddles the mountain, from the winding Ou Kaapse Weg (Old Cape Road) on the Tokai,Constantia and Westlake side of the mountain, over the peak of the mountain, and into Noordhoek, Sun Valley and Fishhoek, overlooking the ocean. Approaching the Silvermine reserve from the City side of the mountain, along Ou Kaapse Weg, it is possible to view most of the greater Cape Town area, up to the Tygerberg Hills and beyond on a clear day, laid out like a patchwork quilt below. Continuing further along the road, which winds directly over the top of the mountain itself, takes one on a scenic trip through the Fynbos, where thousands of plants, unique to the Cape Floral Kingdom can be seen. If you choose to stay on the road, and having crested the mountain, you are rewarded with a view of the picturesque areas of Sun Valley and Noordhoek, and following the road down the mountain leaves a short trip to one of the excellent beaches in the area. Also within easy reach of the reserve on the Noordhoek side are the small, historic towns of Fishhoek, and further along, Simons Town, steeped in naval history, including the statue of the legendary Just Nuisance, and further still, Cape Point itself. Picnics: Bring your own as there are designated spots all around the reservoir. Bird Watching: Twitchers can spot swallows orange-breasted and malachite sunbirds, rock kestrels, kites, buzzards and peregrine falcons. One may also be lucky enough to spot one of the resident black eagles. Swimming: The reservoir is a fabulous body of water to cool off or train! Mountain Biking: These are on the west side (you need a permit). The most popular is the Silvermine mountain bike trail. Trail starts near the bathroom at the parking lot, passes the reservoir and goes up Noordhoek Peak before circling back. Approximately 7.5km circular route. Hiking: Both the east and the west side of the reserve offer lovely walks - pick up a map at the entrance, the routes are well illustrated and there is everything from a short stroll around the reservoir to longer treks past panoramic viewing spots.